KLM Motors Ltd - Automobile Engineers in Coulsdon, Surrey. Homepage. 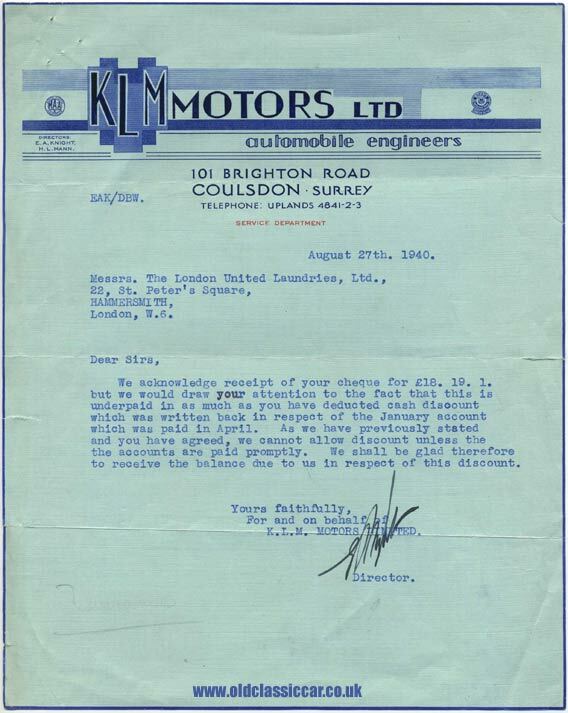 This page: Letter from a garage company located on Brighton Road in Surrey during WW2. Despite motoring being a very restricted activity during the years of WW2, many garage companies soldiered on regardless. An example is KLM Motors Ltd (Automobile Engineers) which was situated at 101 Brighton Road in Coulsdon, Surrey. This letter dates to August 27th 1940, and was sent by the firm to the offices of The London United Laundries Limited, querying a recent payment that had been received at the garage. Two company directors are referred to on this attractively illustrated letter, E.A. Knight and H.L. Mann, and the signature of the former is at the foot of this typewritten correspondence. Unusually, the company is quite modest in advertising its services on their letterhead. A tiny logo for the Motor Agents Association (MAA) can just be seen to the top left, while on the opposite side an equally miniscule reference to KLM Motors Ltd being an authorised Morris cars dealership can be found. The quality of the printing is very high, with raised glossy letters for the company name, printed on linen-faced paper with a thin blue border to the edges. Unlike many other similar letters of this era featured on the site, only telephone numbers are given, no mention of telegrams.